right now depots look the same, regardless if they are for steam, diesel, or electric. i think the buttons should be distinct at least, until someone draws some new depots. This is a good idea - thank you Sdog! I do think that diesel would need an icon, too, though, not least for reasons of consistency. could you suggest a diesel engine? perhaps one that's iconic for BR, or at least has a distinctive look? i hardly know the diesel engines yet. 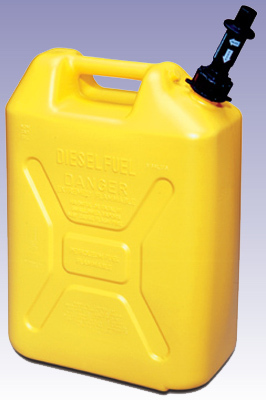 perhaps one of these yellow containers? red is for gasoline, so I wouldn't use red. for electric, the usual electric bolt symbol would be good. not a bad idea at all, and easy to implement. there are two disadvantages however. first is they weren't introduced in britain until WW2 and it's a bit inconsistent with the other two depots showing engines. we can just ignore the first one, since it's a symbol for players today. 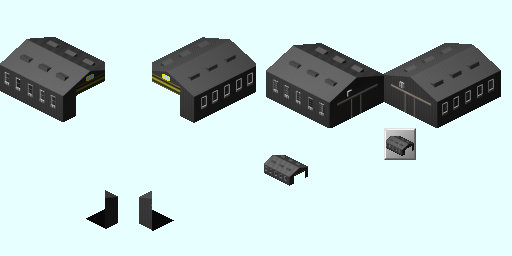 the second can be either ignored, or i could use symbols for the other depots too, eg a flash and a piece of coal. yes, an icon for steam would be troublesome for sure. another thought that occurred to me, is that it would be better to keep a consistent distinctive shape and colour for each of the power types, so that it will be easier to distinguish them in other way types. horse drawn would be the easiest, as you can just use the horse. steam tram and ship might be a bit tricky compared to train and tractor, as the first two share a lot of traits with their non-steam counterparts. The later two are quite distinctive with their boiler and stack pipe. Electrics can be distinguished by their pantograph. Diesel might be made bland looking and use dark colours all around. I think it would be nice if all types can be done with a consistent vehicle picture, but some things can be just hard to identify from the others if a consistent theme was kept. I'm not 100% up to speed with experimental at the minute, so I wasn't aware different depot types for different traction types had been implemented. Certainly for shipyards, the main constraint is the space rather than anything else, so I would recommend that for ships at least any traction type could be built in any depot - if any distinction should be allowed it should be about the maximum size of boat to build. I'm not even sure why it's necessary for rail - although most depots have tended to serve one traction type or another (or even these days just a single class), it's again an issue of land and connections to the network so most depots have been altered to serve different traction types. What was the rationale behind different traction types in different depots? thank you for your work on this. If you want to do a diesel locomotive, might I suggest either the class 47 or the 253 (otherwise known as the "class 43" or "Intercity 125" power car - not to be confused with the earlier class 43 Warship class) in British Rail blue. I think that the symbol idea is better, however: steam could be represented with a smoking chimney, electric with the flash, biological with a horse, sail with a sail, diesel with a jerry can or oil drum, hydrogen with a cloud of vapour, and maglev with a magnet. there is no easy way of specifying a maximum vehicle size for depots (and that would in any event require a change in the code). Shipyards are not constrained by space in the game significantly more than other types of depots as far as I am aware, or were you referring to the prototype? The idea of traction types is more about where vehicles can be built rather than maintained, which is, after all, the function of depots in Simutrans. This distinction matches the prototype, in which facilities for constructing vehicles and conducting major overhauls are specific to their traction types. For those places where the two are combined on the same site - there is nothing to stop a user putting two depots next to each other, which would make the depots more realistic in size in any event. The function behind traction types in economic terms is to give players a certain level of investment in the infrastructure necessary to set up particular types of traction, reflecting the cost of switching between different traction types. i've thought of a better idea than putting an icon on the depot button. We already have appropriate depot types, for most of the time line. For electrics the tram depot is an exact match, it has the high doors to allow the catenary in and fits the style of introduction. When diesel is introduced the modern depot is already up to date. Instead of having the same depot for different traction types and later introduce a new model, just use the different images for the different traction types. The modern depot is introduced in the late 1950s (and has graphics to match), but diesels are around from the mid 1930s onwards; indeed, the "modern traction" depot (capable of both diesel and electric) is introduced in the 1950s, and is the first with the new graphic; earlier deisel depots (that take only diesels) use the same graphic as the steam depot. Also, how would this work with distinguishing steam/diesel road depots and steam/sail shipyards? Diesel train depots are introduced in 1933. There is no need to use the modern depot graphic for the steam depots after 1950, it's only the last decade of steam. Rail in britain was also in the decline, so there will hardly have built a lot new steam depots. The hood already said it's not necessary to distinguish between steam and diesel shipyards. The steam engines aren't manufactured on site anyway, the construction work is the same. What matters is the size, if it is an ocean going vessel or a channel barge. For modern road vehicles the depot should really not matter for diesel/electro/hydrogen or magic, there's no work done on the motors of the latter one, only components and drivetrain etc. The tram depot looks also quite good for trolleybuses. Horse has already it's own stable. There's a temporary solution for steam and diesel road depots required. The icon solution should do nicely there, until someone produces some distinctive graphics. As a side-note: Ingame i don't see any benefit from it, it's just a bit tedious and can be a strain in the early game. So it would matter if the player starts the game in the late 50s and has to decide for either steam, diesel or electric, as there's not enough money and revenue for more than one depot. The difficulty, however, with using that graphic is that the roller shutters are brightly coloured and a very obvious feature, and they are incongruous with the requite era. I don't think that steam and diesel sheds of the same era had different outward appearances, did they? If you are drawing or modifying depots, how about making any highlights, like the roller shutters, in the player colors? That would certainly be appropriate in any era. And it would be nice to distinguish road depots especially in multi-player.